Play Shamans Dream Slot Online with 500 Free Spins! Shamans Dream is a 5 reel, 25 pay-lines Online Slot Game by Eyecon. Shamans Dream has Free Spins, Scatter symbols, Wild Features and an RTP of 95.40%. The Native American world is full of treasures and adventure waiting for you. This popular online slots game will make your imagination and dream about online slot games come to pass. This is another interesting online slot games brought to you by Rose Slots, your favourite slot game site. Continue reading to discover more about the slot game. Shaman’s Dream is an online slots game powered by industry giant Eyecon, which was established in 1997 and since then provided many popular slot games. Most of the slot game lovers should be familiar with their famous game Temple of Iris slot which is still very sought after nowadays. Another big name developed by Eyecon is the all-time favourite Fluffy Favourites slot game and the timeless series thereafter. 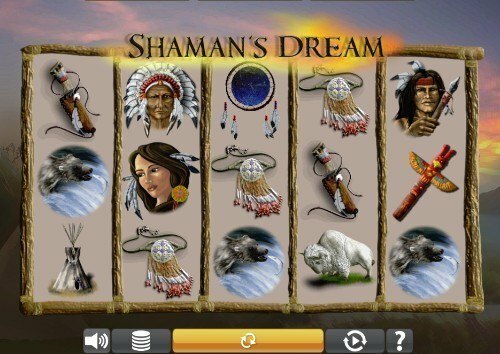 Shaman’s Dream is an online slot game that throws a focus lens on the Native American culture. In traditional American culture, the Shaman was divine and a medical figure who was well trained to communicate with the spirit and control natural forces; most importantly, performed divination which would bring good luck to the local American native. The game is exotic and fun to play, and players are guaranteed with a pleasant gaming experience with the outstanding animated visual and sound effect. If you want to play Shaman's Dream and get a feel for the Shaman, you are at the right place. Here at RoseSlots.com Shaman’s Dream can be played on both mobile devices and desktops. For those who will love to try their luck today on real money slots, Shaman’s Dream has everything you would expect from a video slot. With 5-reel and 25 pay-lines, Shaman’s Dream has a decent RTP of 95.40%. You can set the reels rolling with a minimum and maximum of bet at 0.01 and 25.00 respectively. The icons that you can see as the roll together with the reels are Dreamcatchers, swords, wolves, and eagles. Other symbols that can be seen in this game are the tribe chief, warrior, wigwam, knife pouch, axes, necklaces, and bears. The tribe chief and the warrior that are the most rewarding symbols offer 38 times your stake. The game’s wild symbol is the revered animal in native America, the wolf. This symbol substitutes other symbols on the reels to complete a winning combo. The scatter symbol is the dream catcher symbols, which can be used to activate free spin features and other bonus rounds. Just like many other UK slots, the Shaman's Dream slot game features an interesting gameplay that will get you hooked as you enjoy the game. The free games of Shaman's Dream are triggered by landing 3 or more dream catchers on the reels. Up to 15 free spins are awarded after this. This game by Eyecon is an enchanting online slot which takes inspiration from the mysticism of the Native American people, and belongs to the ‘adventure’ category of games. Gameplay takes place on a 3x5 layout of reels and rows, with 25 fixed paylines, and an RTP of 95.44% Free spins are the game’s main bonus feature, accompanied by a ‘double or nothing’ gamble. When you were growing up, you probably played a few games of ‘cowboys and Indians’ in the playground; and that’s when you weren’t watching ‘cowboys and Indians’ films on television! Although the cowboys always won, there was something fascinating about the world the Indians came from, with their spirituality, their symbolism, and their close relationship to the world around them. Shaman’s Dream, by Eyecon, borrows heavily from that world to create a bewitching slot game. Shaman’s Dream, as you’ll have guessed from the title, prominently features a shaman within the game. If you’re not familiar with the term, a shaman was (and in some cultures, still is), a spiritual healer with supernatural abilities. Almost every nation in the world has believed in the powers of a shaman at some point in their history, but they’ve never been so closely linked with a people as they are with the Native Americans. Setting the scene for this online slot, the location is North America, somewhere away from the urban sprawl and closer to the natural world. We can't say for sure, but if we had to guess, we'd also say it's a couple of centuries back in time, too. Eyecon is excellent with making their games fit the themes they've chosen, and they've done sterling work again here. The framework that the reels sit within is wooden and tied with traditional bindings, and the sun in the background is just beginning to set over the tranquil landscape of the canyons and mountains. Adding to the atmosphere, pan pipes and haunting music plays when the moment calls for it, such as when a winning combination has been found. The symbols of the game are all completely tied in with the title, too. No space has been wasted on things that don't need to be there, like playing card symbols. Instead, every image has its place; daggers, jewellery, wigwams, weapons, a girl who may or may not have been inspired by Pocahontas, a howling wolf, a soaring eagle, a pair of tomahawks and, most importantly of all, the Shaman himself. The Shaman's assistant is also present in the game, and will occasionally make an appearance on the reels himself. Wolves in nature are wild, and so the wolf in this game is, too. The wild wolf marks itself out as being different from the standard symbol by way of its colour; it's white. It will replace any symbol other than the scatter, and create new winning lines by doing so. Every win that involves a wild is worth double, which is a common feature among Eyecon games. The scatter itself is a traditional dream catcher, and comes into play for the game's bonus. Eyecon really has gone all out to make this game worthy of its name; it's respectful to the world that inspires it, and it's a joy to play. The primary bonus on offer within Shaman’s Dream is Free Spins. You'll need a minimum of three dream catchers to trigger the round, and the good news is that they can come from anywhere on the reels. The free spins round in Shamans Dream isn't hugely complex or original, but it can be very kind to players. All winning lines made during the free spins feature are worth triple what they would be in the base game, and if one of those lines is created using a wild, the value doubles again. That means a winning line with a wild in it is worth six times more than it would be in open play. To make things even better, if you're able to find another three dreamcatchers while you're playing your free spins round, the feature will trigger again. In theory, if the right symbols keep coming your way, you could earn a maximum of 400 free spins. As with many Eyecon games, Shaman’s Dream also offers a double-or-nothing Gamble Feature. It’s a straight 50/50 choice, offering you the chance to double your last prize if you choose correctly, or lose it if you don’t. If you really feel like you’re on a lucky streak, and you keep winning, you can play the gamble feature five times in a row. Just remember that if you win four times and lose the fifth, you’ve lost everything you just made! Eyecon is a well-known and well-established UK online slot game developer, with a number of successful releases under their belt. If you've been playing online slots for a while, you'll almost certainly have played at least one Eyecon game before. That doesn't mean they've always been involved in making slot games, though. When they were first born, back in 1997, they made conventional video games instead, trying various different genres and styles before having a surprise hit with ‘Gore', a horror game which racked up several million downloads during the early days of the internet. While some companies would have taken this as a sign that they should carry on making horror games, Eyecon learned a different lesson; that the potential for playing games on the internet was massive, and that online gambling would, therefore, one day be a multi-billion dollar industry. Their mind was made up, and they moved into the iGaming industry. Their first success in their new format came in 2003 when they released Temple of Isis, a game that's still available today as Temple of Iris. Not only had they displayed their talent by making the game, but they'd also learned another valuable lesson; well-designed games with timeless themes don't have a shelf-life. People carry on playing them for years. Looking for a timeless theme to build a game around, in 2006 they came up with the first Fluffy Favourites game. The massively popular online slot, which takes players back to their childhoods as they spin the reels accompanied by a cast of friendly stuffed toys, has been their calling card ever since. Fluffy Favourites is now a franchise, around which a whole cluster of sequels and tie-ins has been made. Eyecon currently has just over sixty slot games online, although that number continues to grow steadily. With offices in both Guernsey and Australia, Eyecon is now a truly global brand with dedicated players. Unbelievably, every minute of every day, the reels on Eyecon games are spun 11,500 times. That means that in the time it takes you to read this sentence, hundreds more will have spun and potentially won! “Shamans Dream is one of the most popular online video slot games! You can go back in time and discover and learn all about the Native Americans, including exploring their fascinating traditions. The shamans are said to be the guardians of magic and wisdom in ancient Native American culture, which makes for an extremely interesting and exciting gaming experience in Shamans Dream. You can tell from the way the online slot game is built that a lot of love and hard work went into creating Shaman’s Dream. That comes across in their description of the game; they’re really keen for you to play it, and to love it as much as they obviously do. Eyecon has been around for a long time, and they have a feel for what works in the slot game world, and what doesn't. Therefore if they've had success with a theme before, they're likely to go back to it and give their players more of the types of game they like to play. They've done precisely that with Shaman's Dream, creating both a linked game, and a game that's come from the exact same world. Shaman’s Dream Jackpot: Whenever a developer makes a ‘jackpot' version of one of their original online slots, very little tends to change from the original. The primary difference between any standard online slot and its ‘jackpot' counterpart is that the jackpot version is linked to a progressive jackpot; a much larger sum of money than can be won on the standard version of the game. In return, the RTP is dropped down a little. If you want to go chasing after the biggest pots of money, you have to accept that the prizes will be harder to find! Everything about Shaman's Dream Jackpot is identical to the original in every way, but on any spin, the progressive jackpot round may trigger. The maximum jackpot available is, in theory, a massive £32,000. Shaman Spirit Jackpot: Just as there's a jackpot counterpart to Shaman's Dream, there's also a jackpot counterpart to Shaman Spirit. It works in precisely the same way we described the Shaman's Spirit Jackpot game; the base is absolutely identical to Shaman Spirit, but at any time a progressive jackpot may trigger, and give you a chance at much larger winnings. It isn't the most popular theme for online slots, but other developers have taken inspiration from the Native American world before. They're not all as immersive or as attractive to look at as Shaman's Dream, but some of them hold up very well, and all of them have their particular charms. Here are some of the best known and most played alternatives out there. Wold Gold: What would Shaman's Dream look like if we took all of the Native Americans out of it, and let the animals of the canyons run wild? Chances are it would look a lot like Pragmatic Play's Wolf Gold. It's a comparatively new game that earned rave reviews when it was first released, including some ‘game of the year' awards. That's why it's another game we're pleased to offer it to roseslots.com players. The bonus features are generous and easy to understand, the animations are beautiful, the RTP is 96%, and this is a game that will be referred to as ‘classic' a couple of years from now. Wolf Run: This is another game that looks like a deserted Native American settlement inspired it! There are plenty of symbols of their culture here, including their distinctive totem poles, but not an actual Native American in sight. The same kind of animals that roam the Wolf Gold world are here in force, though. This isn't as pretty as the other games we've mentioned so far, but the gameplay is undeniably good. RTP is 94.98%, and 40 paylines gives players a lot to chase after. Stacking wilds mean that the game offers small payouts with a fairly reliable regularity, which keeps you coming back for more. Coyote Moon: We don’t know why other developers are so reluctant to involve Native Americans in their games, but we’ve definitely found a theme! Coyote Moon is a game by the IGT studio, and goes along the same lines as the slot games we’ve mentioned already; we have the canyons, the wolves and the other symbolism, but not so much as one Shaman, chief, or any other human character. Graphically speaking this is a very plain game, and the 30 paylines don’t quite make up for the comparatively low 92.50% RTP. It’s simple and easy to play, but Shaman’s Dream isn’t particularly complicated to begin with, so we can’t find a reason to recommend this over the Eyecon game. Totem Treasure: This game from Inspired nearly gives us a Native American character; there's a rider on a horse in silhouette serving as the wild symbol, and so we're going to count them. The base game is simple enough; a 5x3 layout with 20 fixed paylines, but the real fun to be had comes with building your own totem pole by stacking symbols in one of the bonus rounds. That's a novelty we haven't seen elsewhere, but we wish the graphics were a little better so we could appreciate it more. RTP is 96%, and the game is linked to a progressive jackpot that may appeal to those who like to chase big wins, but then you could do that by playing Shaman's Dream Jackpot if you wanted to. We've reviewed many Eyecon games, and we've noticed that they're better than most at making their games playable as mobile slots. We're expecting a sleek and smooth transition from the laptop version of the game to the mobile version, with no lost functionality and no degradation in quality. So did we get it? Yes, we did. Eyecon has hit the mark again, with a perfect translation of the game from one type of media to the other. The visuals are just as clean and sharp, the sounds ring out just as clearly, and the game works in the exact same way. The mobile version of Shaman's Dream is even smart enough to know if you're holding your phone upright or tilting it and will rearrange the buttons and the reels to suit. When it does so, it does it without putting the buttons in the way of the reels or shrinking the reels to make everything fit, which is a mistake we've seen other developers make all too often. We might even be persuaded to say that the mobile version of the game is better looking; more of the beautiful backdrop is exposed, which is beneficial to the game’s immersive atmosphere. We seem to say it every time we review an Eyecon game, but well done again, Eyecon, you really do know how to adapt your games for mobile devices! Because Shaman's Dream has been out for a little while now, the initial media interest that came with its release has faded away. The attention of the industry press has moved on, and so it's uncommon to find people writing about Shaman's Dream. That's not to say the game isn't great; it's just that the press is all about what's new, and Shaman's Dream just isn't new anymore. It's still a well-known slot game, though. The website of the Vents Magazine publication wrote about spiritualism within video games recently, and how developers represent the concept. Shaman's Dream was on their list; which doesn't surprise us at all. Playing the game is a soothing experience, and we've found it to have a calming effect on us; unless of course we're not winning! Shaman's Dream is a unique online slot game to play. It's beautiful, it's tranquil, and it's got just enough in terms of extra features to keep the game exciting while remaining gentle in its approach. If games with too many flashing lights and aggressive sounds put you on edge, you may just have found a remedy in Shaman's Dream! If this game sounds like a dream to you, then our dream would be for you to stay with us, and play it on roseslots.com. We don’t believe in taking deposits from players before they’ve even decided to spin a reel with us. It won’t cost you anything to register with us today. In fact, you might even earn something from us just for signing up; all new customers can potentially win up to 500 free spins just for giving us your details and going through the process! Every time you top up a minimum of £20 with us (using our secure Paypal method), you could win more free spins. That means whether you're entirely new to us, or you've been with us for a while, there's always the chance at free spins around the corner. And that means more gameplay on your favourite games, at less cost to you. Talking about your favourite games, Rose Slots has a library of over 600 titles ready and waiting for you to come and play. We have games in the traditional genre, fantasy games, sports games, horror games and everything in between. Whatever your preference, there will be something in our catalogue which will appeal to you. Rose Slots is a fun, friendly online slot website, offering a fantastic range of games and constant incentives to our valued players. We realise that there are hundreds of other slot game websites out there, and so we always go the extra mile so you'll continue to choose us above anybody else. Whether that's free spins, cashback offers or some of the other brilliant incentives we regularly offer to our members, there's always something to play for at Rose Slots other than just the next winning line. Get involved today and see what we can offer you!